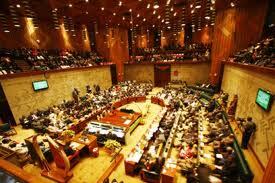 Zambian Parliament which has 16 women MPs out of 150. … when Dr Michael Kaingu tore the President’s speech late in 2012 and no serious action was taken against him not to talk of efforts to revise the ethics and code of conduct for our honoured men, the madness seed was sown. When madam Dora Siliya did a middle finger up on HE Michael Chilufya Sata (MHSRIP) and received some encore, the seed was fertilised. Who ever thought a day would come when our members of Parliament would turn Parliament into a rally stage, when our honourable men would invite each other for a fight right on the floor, when our law makers would slap, push and baptise themselves amidst a pending economic, social and political crisis?